In the first half of 2016, the first devices with the new high end SoC called Snapdragon 820 are supposed to appear. Qualcomm has now finished its developing devices and allowed us to run first benchmark tests on the high-end SoC. 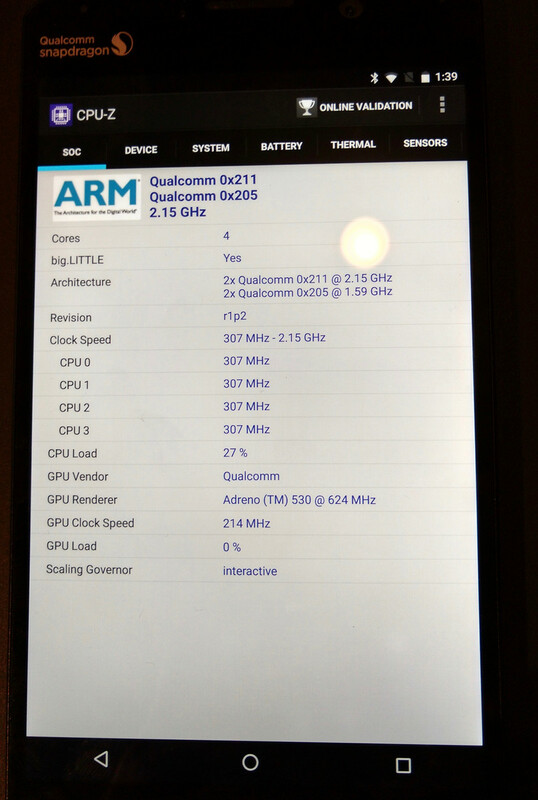 In a benchmarking event from Qualcomm we had the chance to test the next generation top model of the Qualcomm Snapdragon SoC. 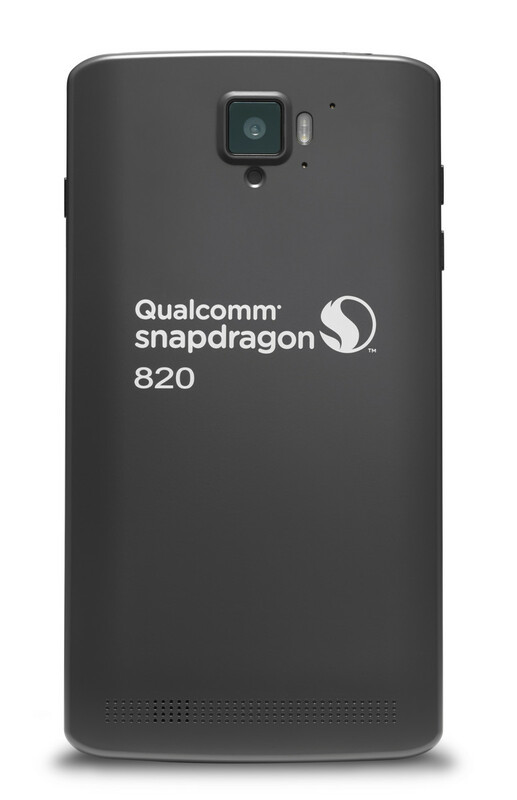 The Snapdragon 820 was incorporated into a development platform from Qualcomm. This oversized smartphone is meant for hardware and software developers and internal use. 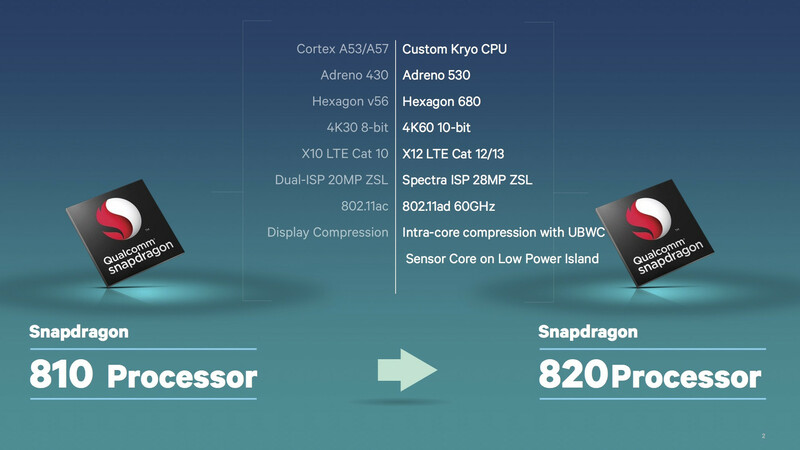 Final products with the Snapdragon 820 are expected for the first half of 2016. According to Qualcomm, the MDP/S (Mobile Development Platform Smartphone) is still in a relatively early state. Thus the benchmarks have to be taken with a pinch of salt. Moreover, the case is relatively thick and slimmer and smaller smartphones might reach a different performance due to thermal limitations. CPU-Z shows the four cores in a big.LITTLE combination and the clock speeds (idle and load) of the GPU and CPU. Qualcomm uses four newly developed Kryo cores with full compatibility to the ARMv8 ISA instruction set as processor cores. These are divided into two clusters, which can be clocked differently. The performance cluster clocks at up to 2.15 GHz and the energy-saving cluster works at up to 1.6 GHz. This is similar to the big.LITTLE concept from ARM. Please refer to our benchmark page of the Snapdragon 820 MSM8996 SoC for further information about the processor cores. In our benchmarks with the MDP, the new CPU delivers an excellent performance. The previous Snapdragon 810 (e.g. as v2 in the OnePlus 2) is outperformed in all tests. This has been made possible by powerful single-core performance, which is on par with an Apple A9's. In the multithreading tests, the A9 can be easily left behind due to the use of all four cores. However, the higher clocked A9x in the iPad Pro still performs significantly better in both scenarios. The fast Exynos 7420 Octa (e.g. in the Galaxy S6) performs better in several tests (Smartbench or 3DMark physics tests) but is slower in Geekbench. 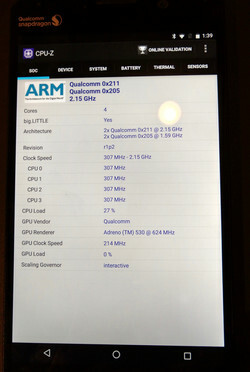 The concept of the quad-core processor with two fast and two frugal cores seems successful in the benchmarks. The S820 does not even need to hide in tests which can use all cores to capacity. Furthermore, the high single-core performance should be highly advantageous in everyday tasks. The performance of the web tests always depends heavily on the used web browsers. Two browsers have been preinstalled on the MDP: A current Chrome 44 (not optimized for the Snapdragon 820 yet) and a build of Chromium optimized by Qualcomm. We ran web benchmarks with both of them and the differences were partly big. However, the top smartphones with Snapdragon 810 or Exynos 7420 can be outpaced in general. But, the iPhone 6s and iPad Pro with Safari perform significantly better, since browser, platform, and SoC are perfectly adjusted to each other. Only a few details of the new Adreno 530 are known. Qualcomm boasts improved performance and efficiency. All modern instruction sets for smartphones (like OpenGL ES 3.1 + AEP in Marshmallow) are supported. Please refer to our GPU page about the Qualcomm Adreno 530 for all details and current benchmarks of all test devices. In our benchmarks, our reference system from Qualcomm shows interesting results: New and demanding benchmarks can use the Adreno 530 to capacity and achieve excellent results. However, the advantage is a bit lower in older graphics tests. Apart from the slightly disappointing results in the relatively undemanding 3DMark Ice Storm, the graphics card can outperform the Adreno 430 in the S810, the Mali-T760MP8 in the Exynos, and the PowerVR GT7600 in the new iPhones. Only the huge graphics chip in the Apple A9X (iPad Pro), and Tegra X1 (however, we still do not have results of the new Pixel C) are faster. The MDP from Qualcomm with the Snapdragon 820 also does not show weaknesses in the memory and flash performances. It can, for example, draw level with the iPad Pro in the BaseMark OS II memory test. In system performance, the Snapdragon 820 can also outperform the S810. The performance should be sufficient for a top spot in the new Antutu v6 with 131,000 points. According to Antutu.com, the A9 in the smartphones is currently leading with 123,600 points. However, the A9x in the big iPad Pro is even significantly faster in our tests. The Exynos 7420 and the Snapdragon 810 are also far behind with about 80,000 points. The Quadrant shows a similar ranking with the S810 and the Exynos ranking in at the bottom, too. In the BaseMark OS II total score again only the A9x performs better. It is surprising that the Tegra X1 or even the K1 are in front in AndeBench, but overall the benchmarks show an outstanding performance of the Snapdragon 820. 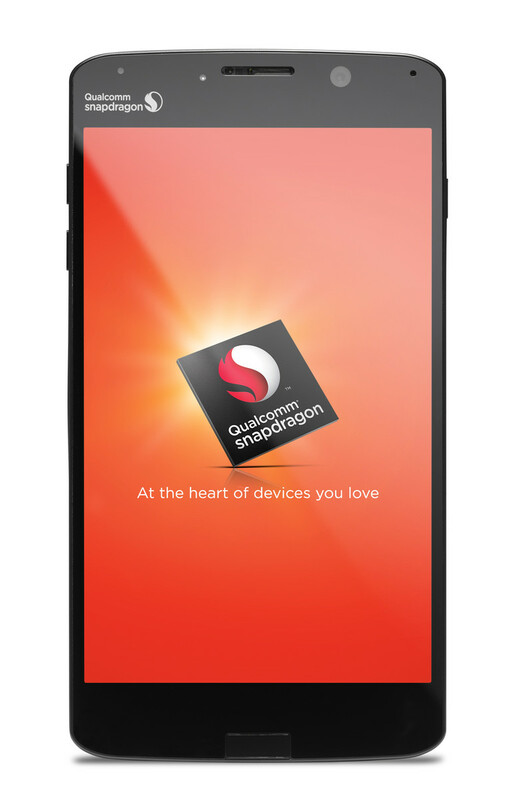 The first impressions of the new Qualcomm Snapdragon 820 are positive. In the Mobile Development Platform (MDP) from Qualcomm, which is comparable to a small tablet, we did not observe heating or throttling problems in our tests. The benchmarks are throughout excellent despite the early development state. The old Snapdragon 810 can be significantly left behind and the current reference in the Android segment, Samsung's Exynos 7420 Octa, performs mostly worse than the S820. In the ARM world, only the A9X, which is used in the big iPad Pro, is still better than the Snapdragon 820. It will get exciting in the first half of 2016, when the first final devices with the Snapdragon 820 will appear. At that time, it will be seen whether the S820 may be called the fastest Android SoC. If there are no major throttling issues, it will certainly be one of the best Android SoCs. We recommend checking out our benchmark pages of the Snapdragon 820 and the Adreno 530, which are regularly updated and include the newest benchmarks.